Foam Tying Discs are used to tie the heads and bodies on unique and attractive ants, hoppers, crickets, damselflies, dragonflies, beetles, stoneflies, caddis and cicadas without having to use deer or elk hair. The yellow, orange and red discs can be tied in on any pattern to use as a sight indicator. Kreinik Foam Tying Discs can also be tied in as a diving head on diver patterns, and you can tie the disc upright and facing outward to tie a popper. There is virtually no end to the uses for these discs. 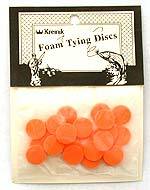 Foam Tying Discs - 1/4"